• Offer them 5-6 small frequent meals, instead of three big meals. • If a person with dementia struggles to use a spoon, then offer him nutritious finger foods. 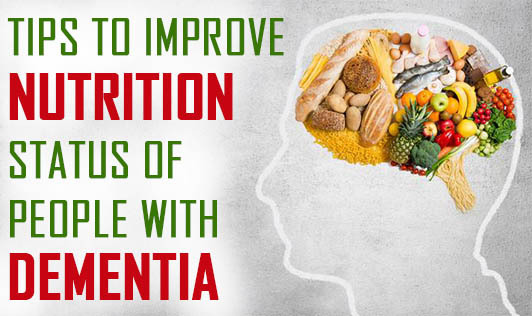 • Lack of co-ordination often makes eating difficult and slow for a person with dementia. Pressurizing him to finish his meal quickly may make him leave the meal unfinished. Make sure you give him enough time to finish his meal. • Dehydration tends to worsen confusion and cause constipation and dizziness in a person with dementia. Make sure the person drinks enough water throughout the day. Place a cup of water in the persons hand and guide him to drink water. If holding the glass is difficult, then give him a straw or a sipping cup, to help him drink water. • If the person has difficulty in chewing or swallowing food then refer him to a speech therapist, who will suggest strategies to help him eat food easily. • If he is losing too much weight, then refer him to a dietitian for dietary assessment and advice. • A person with dementia may struggle to convey his food choice. Make an image of the food or meal to help him make a choice; this will also help you remind him about the food choice he made. • If the person has dentures or has trouble chewing food, then give him soft food or cut the food in to small bite- sized pieces. • If chewing or swallowing is seriously difficult, then gently move the person's chin in a chewing motion or lightly stroke his throat to encourage swallowing. • Minimize distractions while eating food. Turn off the television or radio and eliminate the unneeded items from the table. • Improve his appetite by including appealing foods that have familiar flavors, varied texture and color in his diet. • Maintain a familiar environment and routine, but at the same time be flexible and adapt to his changing needs.